Choosing St. Croix as your destination for an island vacation is a great idea, and whether you’ve decided to rent a villa or book a hotel room, you won’t be disappointed with this scenic and slow-paced Caribbean gem. There’s snorkeling and diving at Buck Island to keep you entertained, along with golf courses, casinos, and even a rum distillery that offers tours. Use the information on this page and under the other tabs to help you plan your trip to St. Croix. St. Croix has flown seven different flags. It has been colonized by Spain, Great Britain, the Netherlands, France, the Knights of Malta, Denmark, and the United States. Arawaks and Caribs inhabited it prior to European colonization. Christopher Columbus visited here on November 14, 1493 at the Salt River. He called the island Santa Cruz (“Holy Cross”). His initial visit led to a battle in which one Spaniard and one Carib were killed. This began a warfare between the Spaniards and Caribs which lasted for over a century, until the Spanish abandoned the island. In the seventeenth century, Dutch and English settlers settled the island. Eventually the Dutch abandoned their settlement. Next, the English settlement was destroyed by the Spanish, who retook the island in 1650. However, they in turn were immediately ousted by the French. Today, the U.S. Virgin Islands remains under the U.S. flag. However, the islands are an unincorporated territory with a non-voting delegate to the United States House of Representatives. Residents are U.S. citizens, but have no vote in national elections and generally do not pay taxes to the U.S. Internal Revenue Service, though taxes are paid, using U.S. law, to the Virgin Islands Bureau of Internal Revenue. Tim Duncan, former NBA Basketball Player for the San Antonio Spurs, grew up here! 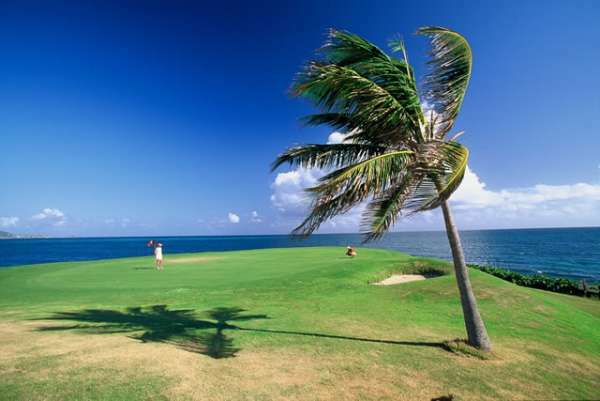 Golfing on St. Croix - Three courses to enjoy! St. Croix's three golf courses, the most of any of the United States Virgin Islands, offer three distinct opportunities to enjoy the game. Tee off on one of the two 18-hole courses with a white sand beach and turquoise sea in your view or play a quick 9-holes on the West End before you head off to the beach. Jump Up Festivals happen four times a year! Fun for the whole family. 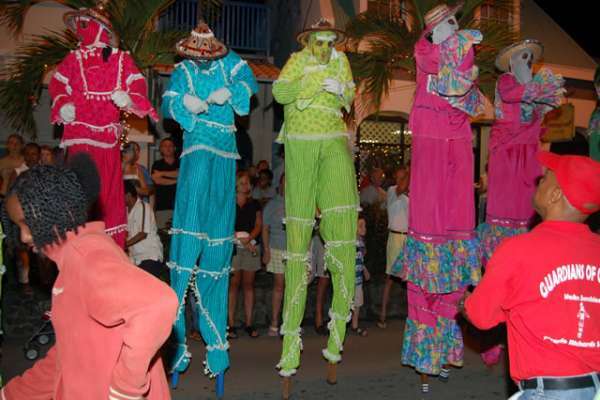 Jump Up Festivals happen 4 times a year - the streets close, there's live music on every corner, and dancing Mocko Jumbies! Fun for the whole family. Kayak by Moonlight and experience Bioluminescence! Kayak through the Salt River National Historical Park and Ecological Preserves. The tour is three hours, and highlights the ecological and historical aspect of St. Croix. You can also take a 2 1/2-hour moonlight tour that takes you out of the bay to explore a reef. This company also rents kayaks for individual exploring. Getting to St. Croix, USVI and getting around. Our transportation tips will help make your trip smoother. More good sand advice. U.S. citizens do not need a passport to enter but do require proof of citizenship to return back to the states. A passport or birth certificate with photo ID is sufficient. Canadian and European travelers need a valid passport. Air Sunshine, American Airlines/American Eagle, Cape Air, Coastal Air Transport, Continental Airlines, Delta Air Lines, LIAT, Spirit Airlines, United Airlines, US Airways and Vieques Air Link. Cyril E. King Airport; Flights from the U.S. are direct to St. Thomas. Transfers to St. Croix are via air or boat. Box 70, St. Thomas, U.S.V.I. 00804 or call and request an application at (340) 774-6680. Applicants must appear before a notary public and have the application notarized. If either or both applicants have been divorced, it is required that a certified copy of the divorce decree be filed along with the application. Upon receipt of the notarized application at the Territorial Court, an eight-day waiting period is required. During this time, the couple’s application is posted for public inspection. Before a marriage license can be issued, applicants are required to personally appear before the Clerk of the Court, or her designee, to be examined under oath. Some form of identification is required. Note: No physical examination or blood test is required. Ceremony performed by a judge, $200 fee, ceremonies done only on Wednesdays. Court Office Hours: 8 am to 5 pm, Monday through Friday, except holidays and on Saturdays from 10 am to noon, except on Carnival Saturday. Additionally, by pre-arrangement and $150 per couple surcharge, the court will be available on Sundays and holidays between 9:30 am and 10:30 am. Before making their way to St. Croix, USVI villas, vacationers like to know a little bit of helpful information to make them feel more at home during their stay. Take a look at our travel tips to make your time in villas in St. Croix, USVI even more relaxing. Local area code is 340.